Apple today has made a big change to its suite of native applications for iOS devices, like Mail, Stocks, Compass, Calculator, Watch, Weather and others: it’s now making these available as standalone downloads in the iTunes App Store. What that means for end users of iOS devices is that the majority of the stock apps that come pre-installed can be removed. This puts users in more control of their devices. Yes: you can now remove the Stocks app from your iPhone, among others. Previously, Apple’s apps were only updated when the company issued an iOS update. That slowed Apple’s ability to add new features, fix bugs, address security issues, or make other changes. This has been a massive headache for Apple’s internal development teams. Now it’s adding the following to that list with the following: Podcasts, Maps, Compass, Tips, Calculator, Watch, Voice Memos, Contacts, Stocks, Weather, iCloud Drive, Calendar, Mail, Music, Reminders, Videos, FaceTime, Notes, Find My iPhone, Find My Friends, Music, and its new Home app. By making these apps available in the App Store, Apple could begin to release updates to the apps at a faster pace, if it chose to do so. However, we understand from sources familiar with the matter that the main reason Apple decided to unbundle apps is so users could delete apps from their devices. Apple at this time doesn’t have plans to update its apps at a faster pace. Apple quietly published these apps to its iTunes website on Monday. Product Hunt spotted the Mail app in iTunes thanks to a tweet from Owen Williams, leading to speculation that Apple’s other apps will be made available through the App Store, as well. As it turned out, they were. This news was not announced during the WWDC keynote on Monday morning, nor in Apple’s iOS 10 press release. We’ll know more after the iOS 10 beta is installed. 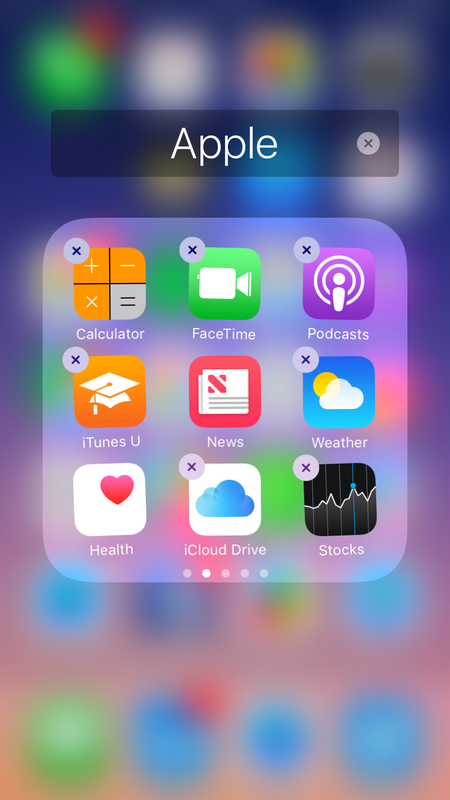 After installing iOS 10’s first beta build, we found that users are able to remove Maps, Videos, Watch, Reminders, Contacts, Weather, Podcasts, FaceTime, Calculator, iCloud Drive, Voice Memos, Tips, Mail, Compass, Stocks, Calendar, Music, and Find Friends. Apps that remain include Health, Activity, Clock (why??? ), News, Find iPhone, Messages, Photos, Wallet, Phone, Camera, Safari and Settings. The Game Center app is not available in this first beta. Not all the apps have been published to iTunes, but this page on the Apple website shows which will be available on the App Store in the future. Note: This article was updated with more information as it became available. Originally we stated that the apps being available in iTunes could lead to a faster release schedule. Why that’s now technically possible, we understand Apple doesn’t currently to intend to speed up the update schedule. We also were able to test app removal on the iOS 10 beta, and updated to note which apps could now be removed.